It’s hard to say really. 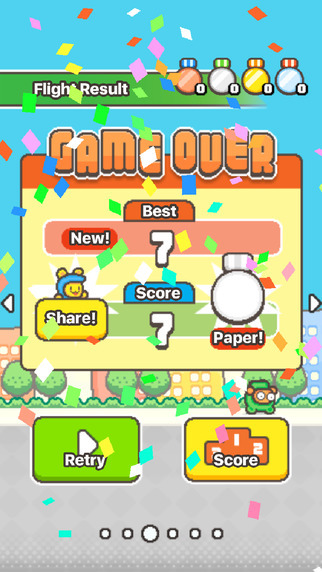 Since “Flappy Bird” launched in 2013, a whole host of games have been released that follow a similar design. They use basic sprites and simple, bare-bones gameplay mechanics — to make them cheap to produce — and put leaderboards and scoring at the forefront. They’re designed to keep you coming back for more, hopefully spending your money while doing so, and “Swing Copters 2” is no exception. The bad thing is, everything about it feels rushed and lazy. It’s a terrible game that is indicative of the overall state of the app store, and it’s disappointing to see this trend continue. 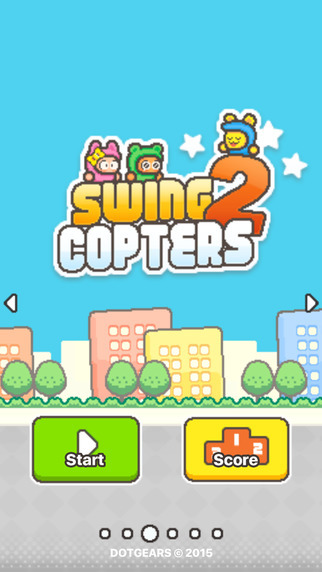 Both “Swing Copters 2” and its predecessor are almost exact copies of the aforementioned “Flappy Bird” — you’re just going up instead of left to right. This isn’t surprising considering both games come from the same developer — who are obviously trying to emulate prior success — but it’s disappointing to see precisely zero new ideas brought to the table. Tapping the screen will move your character to the left or the right. The ultimate goal is to hit a high score, by tapping to dodge obstacles and fit through gaps — each gap you fit through scores you one point. Considering there’s only one gameplay mechanic at play, my expectation was for it to be fine tuned to perfection, but in reality, it’s borderline broken. Hit detection is way, way off — I’d often die without even touching a wall — which ups the frustration factor immensely. 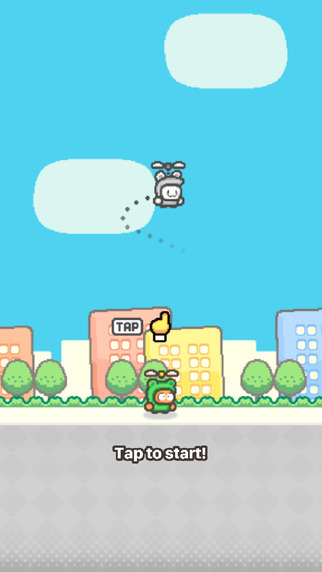 Tapping the screen does indeed change the direction of your copter, but in a bizarre design choice, it does not change your direction instantly — you will continue in the old direction for a split second before turning. Couple these factors with the far too small gaps and the repetitive gameplay and “Swing Copters 2” just doesn’t work, on any level. Games like this are designed to be difficult — it’s to keep you coming back for more, trying to beat your last score, trying to beat your friend’s scores. When you reach 10, 15, 20 points, it does feel great — because it’s so damn hard to do so. That being said, it doesn’t take skill to get those high numbers. It takes luck. You have to hope the hit boxes don’t screw you over, and to a lesser extent, that your cat doesn’t try and claw at your face mid session or that your phone doesn’t spontaneously combust. What this does is make the difficulty artificial. There really isn’t any difficulty — it’s meant to be undoable and it’s this that will attempt to hook you in. Everybody loves a challenge, and there’s no greater challenge than impossible. Despite me actively loathing the gameplay, I actually quite liked the look of “Swing Copters 2.” It struck me as a cross between “Animal Crossing” and “Pokemon”, and it’s a style that took me right back to Nintendo. On the other hand, the sound design here is positively atrocious. It would’ve been better had the developer included a lot more in game sound bites — every single time you tap your phone, it emits a squeaking noise that sounds like a mouse headbutting a wall — and it gets repetitive real fast. The menu soundtrack becomes annoying almost instantly, its high pitch, music box feel just plain grating on my ears. If you’ve played “Flappy Bird”, you know what to expect here. 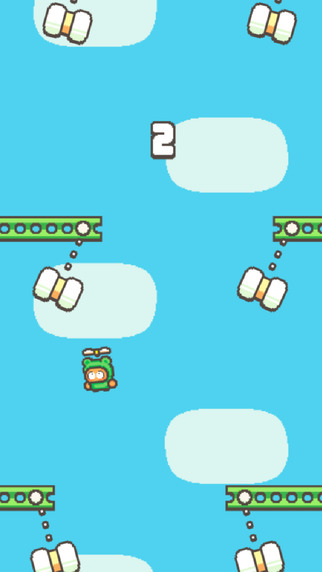 “Swing Copters 2” is almost the same thing, with only minor design choices differentiating the two — and what’s worse, the fundamentals of the game are borderline broken, which makes it infuriating to play. Avoid at all costs. Tested On: iPhone 6S iOS 9.2. Swing Copters 2 on iOS requires iOS 7.0 or later and is compatible with iPhone, iPad and iPod touch.